Stories are reported weekly, sometimes daily, about youth across the country stricken by sudden cardiac arrest. People mistakenly assume it's a rare occurrence that not much can be done to prevent. The truth is, sudden cardiac arrest in youth can be prevented if we take the time to be prepared. 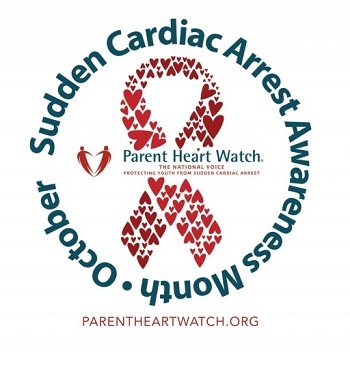 October is Sudden Cardiac Arrest Awareness Month and Parent Heart Watch urges parents, schools, sports teams and any others working with youth to Take the Prevention Promise. With 1 in 3001 youth having a heart condition that puts them at risk for sudden cardiac arrest (SCA), which is the number one killer of student athletes² and the leading cause of death on school campuses³, getting educated is paramount in saving young lives. Find out more about how to prevent sudden cardiac arrest in youth at www.parentheartwatch.org/learnmore. Parent Heart Watch is the national voice solely dedicated to protecting youth from sudden cardiac arrest and preventable sudden cardiac death. Parent Heart Watch leads and empowers others by sharing information, educating and advocating for change. Our vision is to eliminate preventable deaths and disabilities from sudden cardiac in youth by 2030.